*Must present this copy of this Internet Special or mention this specific Internet Special at the time of your transaction. Tax, title, tag, and $695 dealer fee not included in vehicle prices shown and must be paid by the purchaser. While great effort is made to ensure the accuracy of the information on this site, errors do occur so please verify information with a customer service rep. This is easily done by calling us at (904) 712-4318 or by visiting us at the dealership. LS trim. Chevrolet Certified, Excellent Condition, CARFAX 1-Owner, ONLY 10,979 Miles! FUEL EFFICIENT 40 MPG Hwy/29 MPG City! iPod/MP3 Input, Back-Up Camera, WiFi Hotspot, Onboard Communications System, Turbo, Carfax Available. CLICK ME!PURCHASE WITH CONFIDENCEExclusive CPO 2 Year/24,000-Mile Scheduled Maintenance Program, 12-Month/12,000-Mile Bumper-to-Bumper Limited Warranty in addition to remaining Factory Warranty, 6-Year/100,000-Mile Powertrain Limited Warranty, 172- Point Inspection and Reconditioning, Vehicle Exchange Program: 3 Day / 150 Mile Guarantee, Vehicle History Report, 24/7 Roadside Assistance and Courtesy Transportation, 3-Month Trials Of OnStar services and SiriusXM All Access Package (if equipped)KEY FEATURES INCLUDEBack-Up Camera, iPod/MP3 Input, Onboard Communications System, WiFi Hotspot. MP3 Player, Remote Trunk Release, Keyless Entry, Electronic Stability Control, Bucket Seats.OPTION PACKAGESTRANSMISSION, 6-SPEED AUTOMATIC (STD), ENGINE, 1.4L TURBO DOHC 4-CYLINDER DI with Continuous Variable Valve Timing (CVVT) (153 hp [114.08 kW] @ 5600 rpm, 177 lb-ft of torque [239 N-m] @ 2000-4000 rpm) (STD), AUDIO SYSTEM, CHEVROLET MYLINK RADIO WITH 7 DIAGONAL COLOR TOUCH-SCREEN AM/FM stereo with seek-and-scan and digital clock, includes Bluetooth streaming audio for music and select phones; featuring Android Auto and Apple CarPlay capability for compatible phone (STD). Chevrolet LS with Summit White exterior and Jet Black interior features a 4 Cylinder Engine with 153 HP at 5600 RPM*. 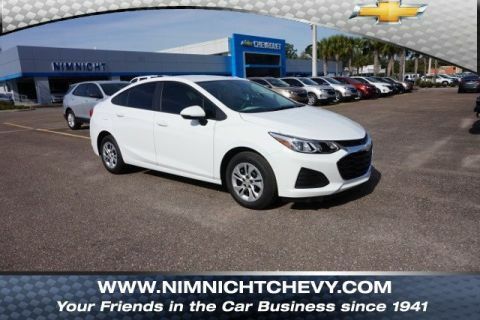 Carfax Available.EXPERTS ARE SAYINGThe Cruze has a nice, firm brake pedal feel Great Gas Mileage: 40 MPG Hwy.Pricing analysis performed on 4/17/2019. Horsepower calculations based on trim engine configuration. Fuel economy calculations based on original manufacturer data for trim engine configuration. Please confirm the accuracy of the included equipment by calling us prior to purchase. 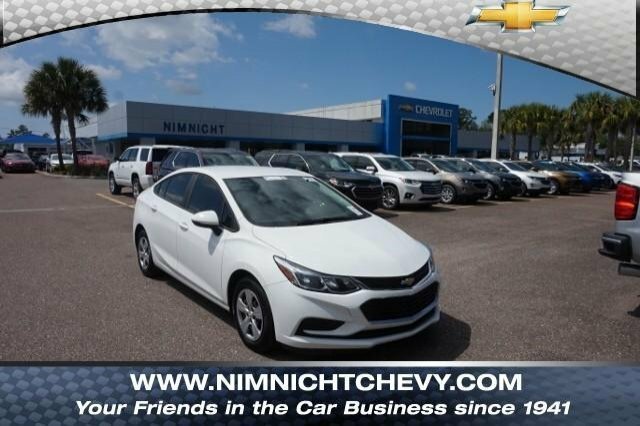 Thank you for your interest in Nimnicht Chevrolet! We happily serve Jacksonville, FL, as well as the Orange Park and St. Augustine areas, by providing quality automotive services and unrivaled customer service. 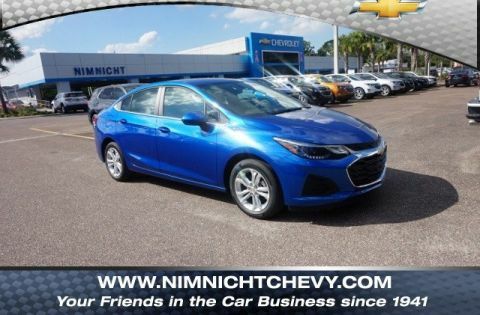 We’re guaranteed to have the perfect vehicle to suit your lifestyle and budget requirements in our impressive selection of new Chevrolets and used vehicles here at Nimnicht Chevrolet, where our philosophy has always been to foster long-term relationships with our customers. 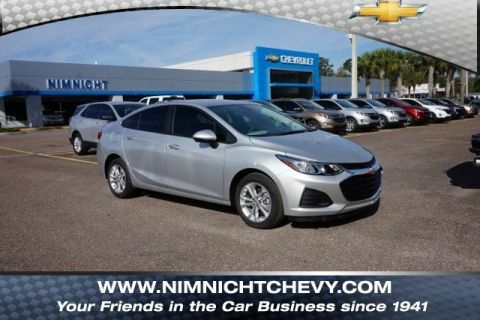 When you’re searching for new Chevrolet models, quality used vehicles, affordable loan and lease options, routine maintenance, quality repairs and genuine OEM parts, choose Nimnicht Chevrolet!